I’m wondering whether the Transportation Security Administration is a valuable part of government. 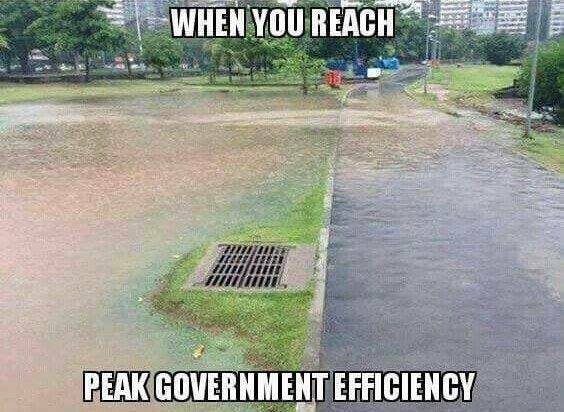 Not because the bureaucracy does a good job, but instead because it does so many foolish things that it helps convince more people to become libertarians. Let’s add a few more examples to this list. Here’s a story from Reason about the Keystone Cops of the TSA, as they deal with the horrific threat of a belt buckle shaped like…(gasp)…a ray gun. Award-winning videographer Sean Malone had a raygun belt buckle confiscated recently by the good folks at the Transportation Security Administration (TSA)….Malone emails that the pinch happened at LAX: …They called it a “replica” of a weapon…. t he guy said, “Yeah, there’s something in there that’s kind of shaped like a gun,” to which I replied, “Yeah. It’s a belt buckle.”… He pulled it out of the bag and looked at it. Yep. Belt buckle….he called his supervisor over, who…said, “Listen, you can either go back out of security and put this in your check luggage (which I don’t have), or we’ll confiscate it.” …I looked at her and said, “You understand that this is a belt buckle, right? It is not a danger to the safety of anyone nor is it against the law to carry….At this point, she got red in the face and loudly declared that she wasn’t going to argue with me or “have a debate about this”. Reminds me of the time I was given a bottle of 100 percent maple syrup as my honorarium for giving a speech in New Hampshire, yet was forced to leave it at the airport because the TSA bureaucrats said my only other choice was to check my bag (which would have cost $25). If a raygun belt buckle is scary to the TSA, you won’t be surprised to learn that kitty cat key chains also are very frightening. Even when in the hands of famous people. This time the victim was HBO star Lena Dunham. She was carrying a Super Scary Terroristy Kitty Cat Keychain. The TSA, ever-vigilant, pounced. But it wasn’t enough that they found the Terrorist Keychain; no, they also detained her. And called the police. Yes…, they summoned the police because of a keychain. I’ve never understood why Lena Dunham is a star, but I certainly can sympathize with her frustration about mindless government stupidity. Most people will agree that TSA bureaucrats can behave like empty-headed drones on occasion, but some of them simply shrug their shoulders and say that’s an inevitable part of government. In other words, we need airport security, so accept that it will be done foolishly. That’s a semi-reasonable attitude. After all, I accept that the defense department will waste a lot of money, yet still want there to be national defense. I only reach that conclusion, though, because even a wild-eyed libertarian like myself can’t quite see how the private sector can defend the country. But why does government need to be involved with airport security? Let’s put the private sector in charge, as Arnold Kling and Nick Schulz have argued. And as Steve Chapman explains, there were lots of benefits to the pre-TSA system. Check out this amazing picto-graph if you want more information. P.S. I am willing to praise the TSA when it does something sensible. P.P.S. And I’m even willing to criticize unfair government intervention at airports when I’m the beneficiary! P.P.P.S. On a totally unrelated topic, give me some congratulations. My beautiful daughter is getting married this weekend. I’ve explained before that “high-speed rail” is a boondoggle, and I’ve also posted a thorough presentation on the topic from the folks at Reason about this issue. But some politicians can’t resist throwing good money after bad on these money-losing schemes. The latest example is from the People’s Republic of California, where Governor Jerry Brown is acting as if he wants the state to become a basket case. Here are some passages from the Wall Street Journal’s editorial on the topic. The good news in this debacle is that the state’s fiscal woes will make it nearly impossible to complete Governor Jerry Brown’s runaway high-speed rail train. The bad news is that the Governor is going to try anyway. Transportation experts warn that the 500-mile bullet train from San Francisco to Los Angeles could cost more than $100 billion, though the Governor pegs the price at a mere $68 billion. The state has $12.3 billion in pocket, $9 billion from the state and $3.3 billion from the feds, but Mr. Brown hasn’t a clue where he’ll get the rest. …In 2008 voters approved $9 billion in bonds for construction under the pretense that the train would cost only $33 billion and be financed primarily by the federal government and private enterprise. Investors, however, won’t put up any money because the rail authority’s business plans are too risky. Rail companies have refused to operate the train without a revenue guarantee, which the ballot initiative prohibits. Even contractors are declining to bid on the project because they’re worried they won’t get paid. Mr. Brown is hoping that Washington will pony up more than $50 billion, but the feds have committed only $3.3 billion so far—and Republicans intend to claw it back if they take the Senate and White House this fall. If that happens, the state won’t have enough money to complete its first 130-mile segment in the lightly populated Central Valley, which in any event wouldn’t be operable since the state can’t afford to electrify the tracks. …Mr. Brown and the White House are betting that the state will be in far too deep when the money runs out to abandon this mission on Camino Unreal. The Governor also figures that the $100 billion bill will seem smaller spread out over 30 years. What’s an extra $3 billion a year when the state’s already $16 billion in the hole? 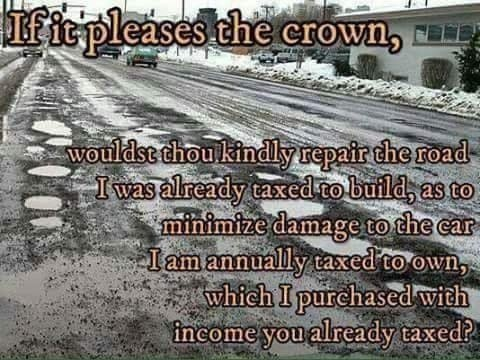 But even though I think there is a value in having bad examples (whether cities or countries), it is tragic to see a beautiful state destroyed by reckless politicians and their big-government schemes. I wrote that year that the last job creator to leave California should make sure to turn off the lights. I doubt that will be necessary since the electrical system probably will have failed by that time. I’ve written before about the importance of getting rid of the Department of Transportation, and I’ve also written about Republicans getting in bed with big government. So you can imagine how agitated I was to read this article about transportation spending at National Review. Written by Andrew McCarthy, it shows that the GOP still has a long way to go before cleansing themselves of the big-government corruption of the Bush-Rove years. Here are some nauseating passages. The problem is not the GOP infighting. The problem is the GOP. Republicans are simply not interested in limiting government or addressing our death spiral of spending. …The federal government should not be in the transportation business at all. A federal role was rationalized in the mid-Fifties to finance the construction of interstate highways. As National Review’s editors observed in 2005, that project was completed in the early Eighties, at which time the fuel tax that funded it should have been repealed and the upkeep of highways left to the states. 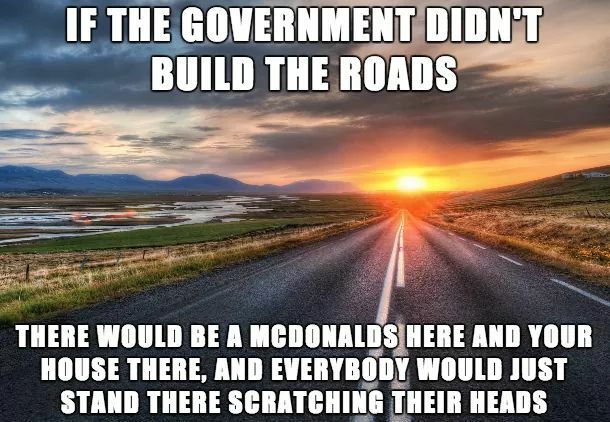 “Instead,” they wrote, “Congress morphed the program into a slush fund for some of its most indefensible pork-barrel spending.” …see how easily a “highway system” morphs into a “transportation system.” The taxes that Leviathan confiscates from drivers, purportedly for road construction and maintenance, are actually redistributed to subsidize other forms of transit preferred by progressives — including walking. For that, you can thank Republicans. With a compassionate wink from President Bush, the Republican Congress enacted an obscene $286.5 billion transportation bill in 2005… SAFETEA-LU featured all the uglies that outraged voters into telling the GOP to take a hike in the 2006 and 2008 elections. These included Alaska’s infamous $250 million “Bridge to Nowhere,” one of the bill’s 6,376 earmarks totaling $24 billion — you know, the sorts of budget-busting recklessness Republicans promised us they’d sworn off in order to get elected in 2010. …And now that the “Pledge to America” crowd that promised to stop the madness is back in charge, what do you suppose the plan is? Why, to persist in the madness. Team Boehner, whose “pledge” to voters explicitly promised “to stop out-of-control spending and reduce the size of government,” proposes to continue funding transportation at “current levels” for the next five years, which translates to an additional budget shortfall of about $60 billion dollars. So much for decrying “Washington Democrats [who] refuse to listen to the American people and eliminate, restrain, or even budget for their out-of-control spending spree.” …Naturally, conservatives who expected Republicans to do what they promised are apt to go ballistic. So, just as in the debt-ceiling fiasco, the establishment’s plan is to dazzle the rubes with some smoke-and-mirrors. On the debt ceiling, it was phantom cuts that would occur, um, someday. This time around it is a commitment to ramp up oil and gas production, the additional revenues from which, we’re told, will alleviate the transportation burden. …The brute fact is that today’s Republican establishment does not believe in limited government. “Limited government” is a slogan reserved for campaigns and fund-raising drives. The idea is not to rein in big government; it’s to hold the reins of big government. Amen. Every time someone posts a comment or sends an email to complain that I’m too mean to GOPers, they should read this column. Principles should come first, not the self interest of a political party filled with corrupt hacks. Yes, I realize that “corrupt hacks” is a bit unfair and over the top. After all, these are the folks who voted last year for real entitlement reform, so I need to remind myself that politicians are combinations of good and bad. But this transportation bill shows what happens when the bad part is running amok. And it teaches us a lesson that it is not progress to replace big-spending Democrats with big-spending Republicans.